Kuskitannee Lodge is the outgrowth of the consolidation of two lodges, Unalachtigo 168, founded in 1939 and Packanke 419, founded in 1949. They merged in 1973 when Lawrence County Council and Pioneer Trails Council consolidated. The number 168 was retained partly because Lodge 168 was the older lodge. 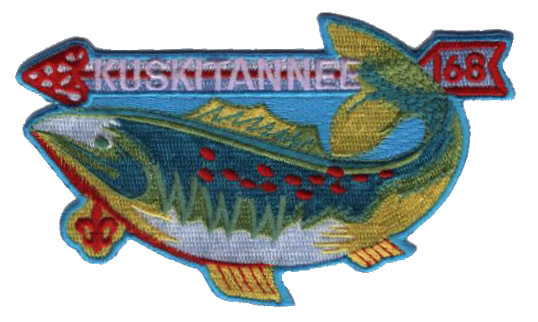 Thus Kuskitannee was formed from Unalachtigo 168 and Packanke 419. William F. Livermore, Scout Executive of what was then Butler Armstrong Area Council, is recognized as founder of Unalachtigo Lodge 168. In 1939 he conducted the first Ordeal Ceremony, having been secretary of the national Order of the Arrow. From that humble beginning the lodge advanced under the trained leader who gave the unit an extra spurt. The name of the lodge, Unalachtigo, in the Delaware Indian language meant eastern Wild Turkey. As a result, the Turkey was chosen as the totem. This stately wild bird was hunted by the Indians in the area of what is now Butler County. The first ceremonial was held on the old ball diamond at Camp Bucoco. There was no fire at that ceremony at which William Graham became chief. In 1942, the first Brotherhood ceremony was conducted inside Bucoco’s old headquarters building. This building was the old cook’s cabin. The Brotherhood ceremony was not moved to the outdoors until after World War II in 1945. During these years membership in Brotherhood was obtained by election only after serving a minimum of two years as an Ordeal. In 1947, Arch McKinney, who was a member of Wagion Lodge in Westmoreland County Council, came into Unalachtigo Lodge as a Vigil member. His move was the result of Butler-Armstrong Area Council taking in three townships in part of Westmoreland County. This included Apollo and Vandergrift. The new council was called Pioneer Trails Council. That made McKinney Unalachtigo’s first Vigil since he came with the tract. The first conferred Vigils in Unalachtigo Lodge were Ralph “Pop” Charlton and William C. Graham, first lodge chief from 1939 to 1942. In 1946, an arrow-headed fireplace was built in the old council ring, which is now the Delaware campsite. Ceremonies for the lodge were held at this hill site now near the water tank until 1951. With the enlargement of the camp, members realized there was a need for a more secluded ring and larger one to provide facilities for the 1951 Area Conference. A new one was chosen. In 1961 it became the present Blackfoot campsite so the OA moved its ring to the present site deeper into the woods. The first ceremonies were held here the fall of 1961. Unalachtigo was first in Area III-B, until a reapportionment placed #168 in Area III-F in 1953. The other lodge from which Kuskitannee was born was Packanke Lodge #419, chartered to Lawrence County Council. It had been organized August 4-5, 1949, by a group of Scouts, Scouters and a field executive from the “mother lodge” of Erie, A total of 15 were united to that organization. The group took their Ordeal and were initiated at Camp Sequoyah. Those taking part were Scout Executive T. G. Allen, Field Executive John D. Lawson, Jim Norton, Jack Brooks, Frank Connor, Bill Hauschild, Byron Brooks, Charles West, Willis Peacock, Harry Wright, Jim Kennedy, Ray Zeigler, N. J. McCluskey, Charles Follette and Robert Leasure. After being accepted into the order of the Arrow at Sequoyah, the group returned home and the following October put on its first Ordeal at Camp Agawam, the Lawrence council camp. It was two years before Packanke had its first Brotherhood member and not until 1955-56 did Lodge 419 gain its first Vigil Honor member. From then on 419 attended all area and national functions. At time the delegations were not large but the members were enthusiastic. The lodge chose Chief Packanke, prominent leader of the Munsee (Wolf) Clan of the Delaware tribe and chief of the Kuskies town Indians about 1749, as the totem. The patch was green and white with the chief’s profile on it. In addition to being active in attending area and national events, Lodge 419, in “being mindful of our higher traditions we have strived to promote Scout camping, but have also spent hours in service work at Agawam for its improvement and the benefits of future campers,” the Packanke historian wrote in 1965. The lodge presented Camp Agawam with a canoe and several rowboats that year. They also provided several tables and chair sets for the camp dining hall. At the 1965 Area III-B Conclave, Lodge 419 won ribbons in the phys-o-rama and other events for a total of eight. There is more tradition and spirit behind Lodge 419 than a list of names. When the OA at New Castle selected Packanke as their totem they had behind the selection the tale of a great figure in Indian Lore. Chief Packanke played a big role in helping the English and white settlers in defeating the French who claimed the Western Pennsylvania section. He was one of the first Indian warriors and leaders won over to Christianity. Chief Packanke was first mentioned as being at Kuskuskies town, New Castle, about 1749. The Munsees were a division of the Delaware tribe who lived on the upper reaches of the Delaware River above the Lehigh River junction, which empties into the bigger river in Easton, Pa.
Packanke is mentioned again by Christian Frederick Post, a Moravian lay missionary and Colonial emissary who was sent into Western Pennsylvania by the Provincial Philadelphia government to try to lure the Delawares away from the French who were laying claim to that Wilderness area. Post wrote in his personal journal of 1758 that Chief Packanke was one of the Indian leaders at Kuskuskies who helped keep the French forces and their Indian allies split while Gen. John Forbes on Nov. 25, 1758, captured Fort Duquesne at what is now Pittsburgh. Post may have started the conversion of Packanke to Christianity on his trips, first in July, 1758, and again, in Nov. 1758. White men and their families poured into the wilderness area after Fort Duquesne at the “Forks of the Ohio” fell and became Fort Pitt. With the coming of more white settlers many Indians moved further west into the Ohio Territory. Chief Packanke was one of these. Some of the Kuskuskies went to the Tuscarawas Valley in what is now New Philadelphia, Ohio. Our data on the chief is sparse from the time of the move about 1772 when Moravian missionaries and Delaware Indians are known to have begun Schoenbrunn Village southeast of today’s New Philadelphia. They occupied some 60 dwellings here but the village was abandoned in 1777 probably due to the stepped-up border warfare by the British and Indian allies as the Revolutionary War increased in intensity. There is a cemetery called “God’s Acre” in Schoenbrunn Village, which has been reconstructed with a schoolhouse, a church, a museum with recovered relics and other log cabin buildings similar to those built by the Moravians and Delawares. Buried in that cemetery is a man called “Solomon”, a Christian name given to Chief Packanke once the mighty brave and proud chief of the Wolf Clan. Packanke was believed to have been baptized at Lawunakkanek (today East Hickory, on the Allegheny River above Tionesta, Pa.) Dec. 25, 1769 by David Zeisberger. Chief Packanke was admitted to Holy Communion March 28, 1771 and had only four years to enjoy life with the Moravians at Schoenbrunn. These must have been trying years with the British fighting the Colonials and the Indian not understanding how a few decades before, the British and Colonial settlers were allies. Packanke was probably a puzzled old man when he died at Schoenbrunn Village Sept. 28, 1775. It would be a nice gesture on the part of the Lodge 168 Arrowmen of Moraine Trails Council if they made a pilgrimage to Schoenbrunn to pay the chief of the Kuskuskies, one of their “own” Indian heroes, tribute. When the councils consolidated in 1973, the new lodge name was Kuskitannee Lodge #168, W.W.W. The name was derived by using Kusk from the Kuskuskiees- Kittany, the name of the trail which stretched across Butler County from New Castle to Kittanning and also thename of a village on the Allegheny river. The totem selected was the Brook Trout which inhabited Slippery Rock Creek, which bound the two council camps, Agawam and Bucoco. The lodge neckerchief and pocket flap naturally bear this totem. A lodge fighting song was adopted. Special T-shirts and jackets were also soon available and caps given to active working Arrowmen of the lodge bore the insignia. Kuskitannee’s first chief was Bill Wilson of New Castle. The lay advisor was Harry Wright also of that city. Professional advisor was Bruce D. McElroy, program director of the council. The new lodge went to DuBois, Pa., to the last Area III-B Conclave Aug. 17-19, 1983, and when the Section 5-C was formed , Kuskitannee sent delegates to that training session as it has each year since. In 1975, Kuskitannee Lodge hosted the Section 5-C Conclave at Westminster College, New Wilmington, Lawrence County, with the young lodge’s officers getting into the “thick of the action”. It was thought the college would give the section meeting a new atmosphere. In 1983, Lodge #168 hosted the 5-C Conclave at Camp Bucoco as the policy shifted again. More than 300 Arrowmen attended that meeting. E. Urner Goodman Awards for its excellence. Dunn has pushed the lodge hard and helped to weld it into one of the finest in the nation He retired and left the council after the June, 1991 conclave. A special patch was designed to mark the tenth year of the lodge and more activities were scheduled. Now there would be the Fellowship winter weekend, the Spring Ordeal, the Big Three after camp closed, and the annual Father-Son dinner. Special awards, like the hat, and pins would be given to members who attended the four most important yearly events. In ’90 at the recognition dinner three members received their 11th pin for 11 years of work. In 1984, the lodge erected the beautiful metal lettered sign at the entrance to Camp Bucoco on Route 8 north of Butler. By 1988, Kuskitannee had hosted 5-C Conclaves again and furnished at least three Section Chiefs. George Andrews, first lodge chief, became a Section Chief, then later was Northeast lodge chief; Tony Sbarra, Jr., in 1983 and Thom Gaiser was also section chief. Other lodge members have been secretary or held other posts. First lodge chief Bill Graham estimated in 1989 between 4,500 and 5,000 youth and men had become members of the lodge from 1939 as the lodge marked its 50th anniversary July 22, 1989 at Bucoco. When Kuskitannee #168 became official January 2, 1973, officers to help Bill Wilson, chief, to run it were Ron Badger, also of New Castle, vice chief; Dave Bock, secretary, and Tony Lucas, treasurer, also of New Castle. W. A. Waggett, council program director, was the professional advisor, and lay advisors were Ole Hunter, and William Clark, associate. Harold Ramsey of New Castle, designed the Brook Trout blue patch. The new lodge was ready for action at both Bucoco and Agawam. About 30 members attended the final III-F Conclave at California, Pa., State College hosted by Kiasutha #57, Allegheny Trails Council. Neal Bronder, Lodge 168, was the last area chief for Area III-F. In service, Lodge 168 has contributed to both camp Bucoco and camp Agawam. Such projects have included erecting a brand new sign for camp Bucoco in 1984 and are responsible for many roofing projects. These projects could not have gone underway without the help of many of Kuskitannee’s lodge chiefs. Kuskitannee Lodge has had many Brothers serve as Section, Region or National Officers: George Andrews, Tony Sbarra, Jr., Thom Geiser, Chris Wells, Nathan Leard, William Stone III and Tony Bury. Kuskitannee Lodge brothers Derek Minto (Odd Tree with a Fork) and Dustin Ferris served as Section Chief and Section Vice Chief, respectively in Section NE-4B. In 2010, Kuskitannee Lodge received a National Service Grant from OA National for $2500. The lodge added $5000 to this to install lightning detection and warning systems at both Camp Agawam and Camp Bucoco.